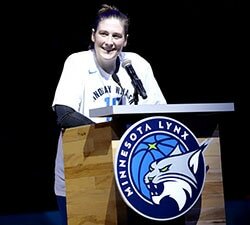 Secaucus, N.J., Nov. 13, 2017 – Las Vegas won the 17th annual WNBA Draft Lottery presented by State Farm® and earned the top pick in the 2018 WNBA Draft presented by State Farm, the WNBA announced today. The results of the Lottery were televised on ESPN2 during the 6 p.m. ET edition of SportsCenter. Las Vegas entered the WNBA Draft Lottery presented by State Farm with the most chances to land the top pick (442 out of 1,000). This marks the third consecutive year in which a team with the most chances to win the Lottery emerged as the winner. The Indiana Fever, which had 276 chances out of 1,000, will have the second selection. The Chicago Sky will select third and fourth. 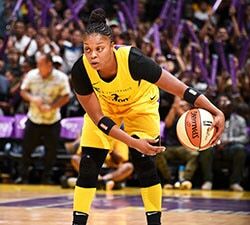 By missing the 2017 WNBA Playoffs, Las Vegas (formerly the San Antonio Stars), the Indiana Fever, Atlanta Dream and Chicago Sky qualified for the Lottery drawing. 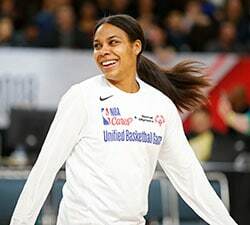 Atlanta’s spot in the lottery (178 chances), however, belonged to Chicago, as the result of a July 31 trade in which the Sky sent Imani McGee-Stafford and Tamera Young to the Dream in exchange for Jordan Hooper and Atlanta’s first-round pick in 2018. Chicago also had 104 chances as the result of the Sky’s 30-38 record over the past two seasons. Lottery odds were based on the cumulative records of the Dream, Fever, Sky and Stars over the two most recent regular seasons (2016 and 2017). A representative from the accounting firm of Ernst & Young was in attendance to oversee the Lottery process. The order of selection for the remainder of the first round as well as the second and third round is in inverse order of the teams’ respective regular-season records solely from 2017.